URUMQI, China — In this old Silk Road city in western China, a state security campaign involving the detention of vast numbers of people has moved to its next stage: demolishing their neighborhoods and purging their culture. Two years after authorities began rounding up Urumqi’s mostly Muslim ethnic Uighur residents, many of the anchors of Uighur life and identity are being uprooted. Empty mosques remain, while the shantytown homes that surrounded them have been replaced by glass towers and retail strips like many found across China. Food stalls that sold fresh nang, the circular flatbread that is to Uighur society what baguettes are to the French, are gone. The young men who once baked the nang (or nan in Uighur) have disappeared, as have many of their customers. Uighur-language books are missing from store shelves in a city, the capital of China’s Xinjiang region, that has long been a center of the global Uighur community. Supplanting the Turkic culture that long defined large parts of Urumqi is a sanitized version catering to Chinese tourists. On a recent morning in the Erdaoqiao neighborhood, the once-bustling heart of Uighur Urumqi, nang ovens were nowhere to be seen — but souvenir shops sold nang-shaped pocket mirrors, nang bottle openers and circular throw pillows with covers printed to look like nang. In northwest China, the state is using technology to pioneer a new form of terror capitalism. In mid-2017, a Uyghur man in his twenties, whom I will call Alim, went to meet a friend for lunch at a mall in his home city, in the Xinjiang Uyghur Autonomous Region in northwest China. At a security checkpoint at the entrance, Alim scanned the photo on his government-issued identification card, and presented himself before a security camera equipped with facial recognition software. An alarm sounded. The security guards let him pass, but within a few minutes he was approached by officers from the local “convenience police station,” one of the thousands of rapid-response police stations that have been built every 200 or 300 meters in the Turkic Muslim areas of the region. The officers took him into custody. Alim’s heart was racing. Several weeks earlier, he had returned to China from studying abroad. As soon as he landed back in the country, he was pulled off the plane by police officers responding to a nationwide warrant for his arrest. He was told his trip abroad meant that he was now under suspicion of being “unsafe.” The police then administered what they call a “health check,” which involves collecting several types of biometric data, including DNA, blood type, fingerprints, voice signature and face signature—a process which all adults in Xinjiang are expected to undergo. (According to China’s official news agency, Xinhua, nearly 36 million people submitted biometric data through these “health checks,” a number which is higher than the estimated 24.5 million people who have official residency in the region.) Then they transported him to one of the hundreds of detention centers that dot northwest China. Over the past five years, these centers have become an important node in China’s technologically driven “People’s War on Terror.” Officially launched by the Xi Jinping administration in 2014, this war supposedly began as a response to Uyghur mass protests—themselves born out of desperation over decades of discrimination, police brutality, and the confiscation of Uyghur lands—and to attacks directed against security forces and civilians who belong to the Han ethnic majority. In the intervening period, the Chinese government has come to treat almost all expressions of Uyghur Islamic faith as signs of potential religious extremism and ethnic separatism under vaguely defined anti-terrorism laws; the detention centers are the first stop for those suspected of such crimes. Since 2017 alone, more than 1 million Turkic Muslims have moved through these centers. Zeynep Ablajan said she hasn’t been able to speak to her husband, Yalkun Rozi, in over two years. He is a Uyghur scholar and textbook author who was detained in Xinjiang, China in October 2016. That was the last time she heard his voice. Ablajan said that he was accused of “disseminating separatist ideology” and sentenced in 2018 to 15 years in prison — a sentence Ablajan said was predetermined and came after a “sham trial.” Ablajan said she doesn’t know where her husband is. “I’m very concerned about his health,” she told CNN, adding that she wants to “hear his voice” and “know if he’s okay.”Ablajan was one of dozens of members of the Uyghur community, advocates and lawmakers who gathered on Capitol Hill in Washington Monday to recognize the plight of the Uyghurs and other persecuted minorities being detained in China. The evening reception capped a day of activism on the Hill organized by the Ahmadiyya Muslim Community. “International media, human rights organizations, and former detainees reported security officials in the camps abused, tortured, and killed some detainees,” the report noted. I would post some pictures of the Uyghurs I met when I was in Xinjaing in 2005, save for the unfortunate possibility that they will cause trouble for people. Future diplomats in the Chinese foreign service are taught that a particular set of ideas and ways of thinking are “correct”. Above all, they are being taught the importance of maintaining correct-ness. While the future of Chinese diplomacy is without doubt exceptionally intelligent, talented, earnest, and hard-working, many budding diplomats have been immersed in a socialisation process that may not equip them to deal with the fast-paced global environment in which they will find themselves. Recently, an article was published describing the global public relations challenge looming for China as its experienced and savvy diplomats age, with no clear replacements lined up to take their places. While the shortage in numbers of diplomats is important, what is also noteworthy is how new diplomats are being trained to think and operate in the international arena…. The first and most fundamental element in students’ socialisation process is the overriding sense of identifying themselves as part of the great imagined community of “we Chinese” above all else. Students would often describe world affairs in terms of “women zhongguoren” (“we Chinese”, translating as “middle country people”) and “nimen waiguoren” (“you foreigners”, literally “outside country people”) — a vast and generally undifferentiated mass of everyone else…. Students also tended to articulate strong views around what China’s role in the world should look like in the future. They argued that the era of hegemony was at an end, and it was now the time for a multipolar international order. They saw China as one of these poles, of course, with others including the US, the EU, and Russia. China was almost without exception understood to be a force for good, a peaceful and benevolent actor, and the leader and representative voice for the developing world. This was based on the premise that China — according to them — had always been a peaceful world player, who, although powerful in the past, had never viciously conquered or invaded others. The example of the Ming dynasty maritime explorer Zheng He (1371-1433) regularly featured in the discussion. 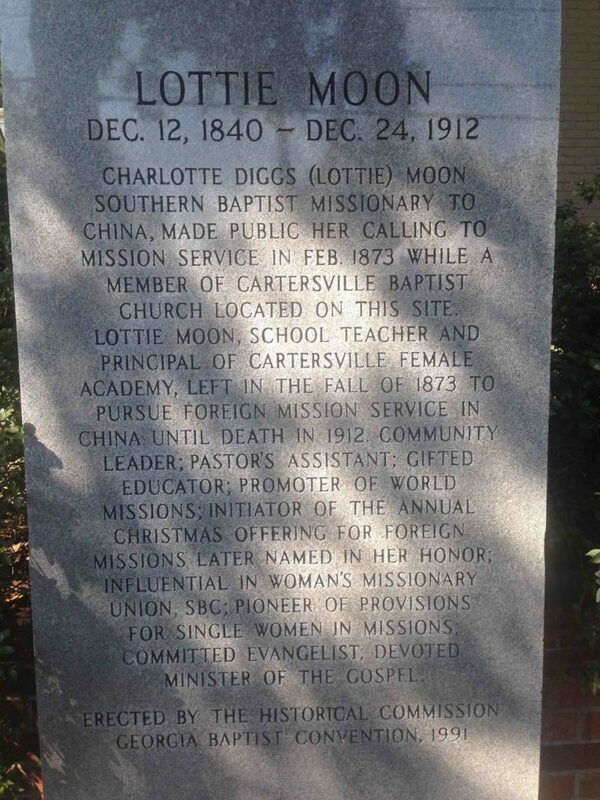 Although missionaries are not exactly fashionable these days, being seen as the propaganda arm of Western imperialism, this is not exactly true, and some of the stories of such women as Lottie Moon, Amy Carmichael, Mary Slessor, or Gladys Aylward are truly inspiring examples of courage, self-sacrifice, and the achievement of actual good, and not just through conversion to Christianity. Slessor, for instance, promoted women’s rights and rescued numerous unwanted children in Nigeria. Five years ago, when I visited Hong Kong on think tank business, almost every politician, civil servant and business person I met emphasized two priorities vis-à-vis the regime in Beijing: How they in Hong Kong wished to retain capitalism and the rule of law. The comments stood out because I’d never heard a Canadian civil servant or politician express such sentiments. But I recall them now for another reason: Because British influence mattered and positively so, not only in Hong Kong but, I would assert, in Canada. For Hong Kong, the desire to retain the rule of law and free enterprise are utterly understandable today to anyone who looks across the territories’ border to the crony capitalism and politicized courts in China proper. But the mostly beneficial British presence between 1841 and 1997 is also worth recalling given what Hong Kong escaped under British governance: China’s turmoil, civil war, communist insurrection and then murderous Mao-Tse Tung policies. In short, the population of Hong Kong was spared the worst excesses of what twentieth-century China endured while the United Kingdom governed the territory and until July 1, 1997. By coincidence, July 1 was not only the 20th anniversary of the British handover of Hong Kong to China but was, of course, the 150th anniversary of Confederation in Canada. Regrettably, there was a plethora of hand-wringing commentary that doubted and outright damned Canada’s birthday as not worth celebrating. I take a very different view: That Canada and her British heritage are infinitely valuable and worth every birthday candle that can be lit. Be it Hong Kong or Canada, three British influences should be recalled and celebrated: The emphasis on free economies, free peoples and intellectual freedom. According to Wikipedia, there is a further cycle of the five elements (water, wood, fire, earth, and metal), so the whole zodiac takes sixty years to complete. 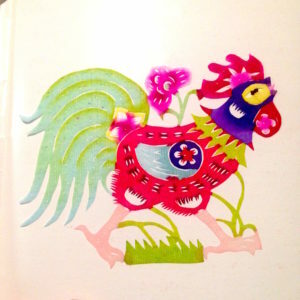 The year 2017 is Fire Rooster, and people born this year are “trustworthy, with a strong sense of timekeeping and responsibility at work.” Apparently a rooster’s lucky numbers are 5, 7, and 8, lucky colors are gold, brown and yellow, and lucky flowers are gladiola and (appropriately enough) cockscomb. 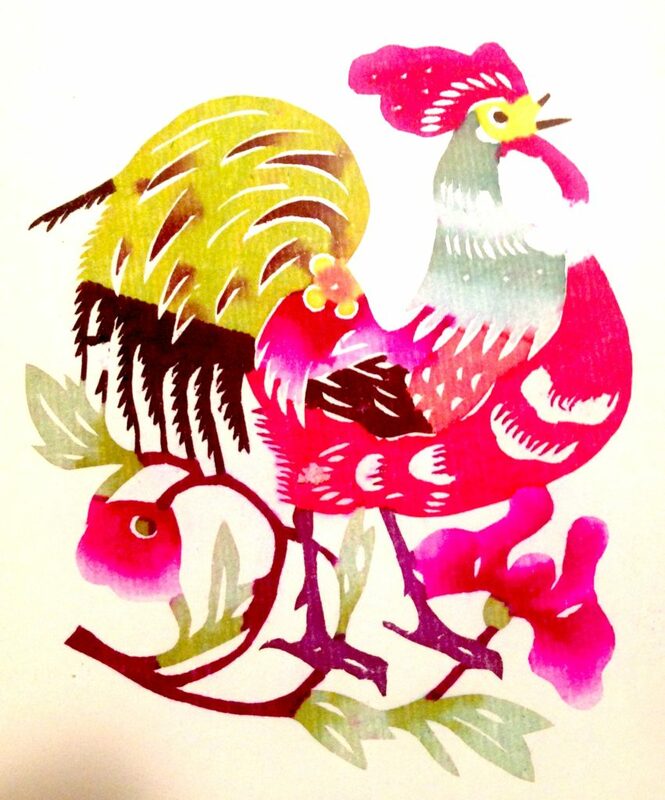 By the way, if you are interested, I have added an essay about my time in China to a tab above. * Or, technically, February 9, 2005 to January 28, 2006. If your birthday is in January or early February, you have to make sure that you were actually born in your putative year. Certain websites can help you out. Chinese linguist Zhou Youguang, who created the writing system that turns Chinese characters into words using letters from the Roman alphabet, has died aged 111. 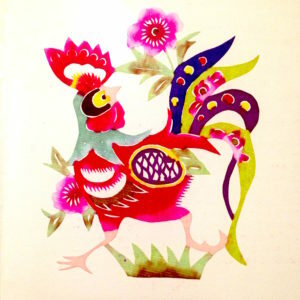 Mr Zhou and a Communist party committee spent three years developing the Pinyin system in the 1950s. It changed the way the language was taught and helped raise literacy rates. 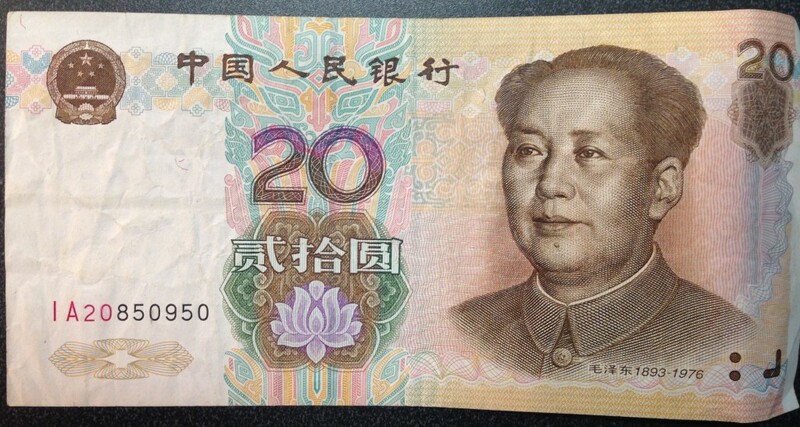 Mr Zhou, who was born in 1906 during the Qing Dynasty, later became a fierce critic of China’s communist rulers. He died in Beijing on Saturday a day after his birthday, Chinese media reported. As a young man Mr Zhou spent time in the US and worked as a Wall Street banker. He returned to China after the communist victory in 1949 and was put in charge of creating a new writing system using the Roman alphabet. “We spent three years developing Pinyin. People made fun of us, joking that it had taken us a long time to deal with just 26 letters,” he told the BBC in 2012. Before Pinyin was developed, 85% of Chinese people could not read, now almost all can. Pinyin has since become the most commonly used system globally, although some Chinese communities – particularly in Hong Kong and Taiwan – continue to use alternatives. It is also widely used to type Chinese characters on computers and smartphones, leading some to fear it could end up replacing Chinese characters altogether. 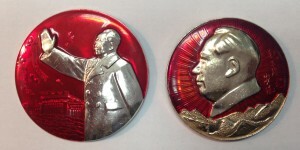 The achievement protected Mr Zhou from some of the persecution that took place under former leader Mao Zedong. 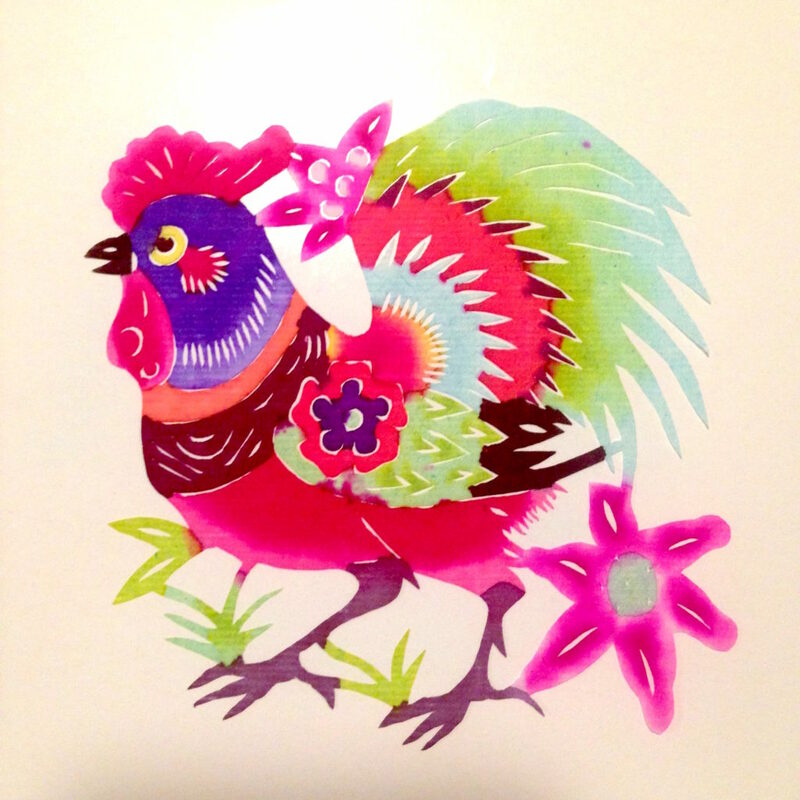 However, he was later sent to the countryside for re-education during Mao’s Cultural Revolution. In his later years he became strongly critical of the Chinese authorities and wrote a number of books, most of which were banned. In a 2011 interview with NPR he said he hoped he would live long enough to see the Chinese authorities admit that the bloody crackdown on pro-democracy protesters in Tiananmen Square in 1989 had been a mistake. He said ordinary people no longer believed in the Communist Party, and that the vast majority of Chinese intellectuals were in favour of democracy. Interesting. I’m surprised that a Wall Street banker would find employment with the Chinese Communist Party but stranger things have happened. But why did the CCP want to come up with a new system of Romanization? What was wrong with the earlier Wade-Giles system (apart from the fact that it was produced by westerners)? Pinyin isn’t entirely accurate itself – but nothing can be, given that certain sounds in Mandarin simply don’t exist in English or other European languages. • From TheProvince.com: Evidence that Greeks settled in China in the 200s BC and may have helped to construct the Terra Cotta Army. One of the more interesting unsolved puzzles of world history is why the region of the world now known as “China” has spent most of the last millennium united under one political regime, while all other centers of civilization, be they in Europe, the Near East, or the great Indic river basins, passed their days divided. Some push the unity of “Inner China” (modern China sans Manchuria, Inner Mongolia, Tibet, Xinjiang, Qinghai, Gansu, and Yunnan) back even further than this, and speak of a single Chinese empire stretching back to the beginnings of antiquity. This is not warranted. While inner China was united under one political regime several times in the first millennium, it was just as often divided between many warring nations and claimants. Were world historians writing their tomes in the 4th century AD, they would conclude that China was a land just as prone to division as Europe. In the millennium that preceded the Sui Dynasty’s conquest of Inner China, the Chinese world had spent more centuries divided than united. Things did not stay this way. In 581 AD he Sui Dynasty brought all of inner China brought under one regime’s control for the second time. Over the centuries this feat that would be repeated by the Tang, Song, Yuan, Ming, andQing in turn. Western history has no parallels to this. There was only ever one Roman Empire. Once it fell, no caliphate has ever matched the glories of the Umayyads. Explanations for China’s peculiar path are many. Some of these theories are more popular than others. The most popular is that Chinese unity was a product of Chinese geography. I debunked that notion in one of the more popular posts on this website. Read that post here, if you are interested; I will not retread that argument in this post. Here I want to tackle another common explanation for Chinese unity: China persisted through the centuries, this theory goes, because the idea of China as a unified empire persisted through all that time as well. Read the whole thing to discover why Greer disagrees with this theory. BEIJING — China’s official media reaffirmed on Tuesday the Communist Party’s longstanding judgment that the Cultural Revolution was a catastrophic mistake after staying silent on Monday’s 50th anniversary of the start of the decade-long upheaval. The official party mouthpiece People’s Daily published an opinion piece on its website precisely at midnight on Tuesday unequivocally praising the 1981 party resolution that condemned the bloody political movement launched by Mao Zedong to enforce a radical egalitarianism. “Our party has long taken a solemn attitude toward bravely admitting, correctly analyzing and firmly correcting the mistakes of our leadership figures,” the piece read. The party has long suppressed open discussion of the tumultuous period, fearing that could undermine its legitimacy to rule and lead to direct criticism of Mao, the founder of the communist state who remains a revered figure. So political observers have been closely observing the party leadership’s attitude toward the milestone as a bellwether of the country’s ideological direction. 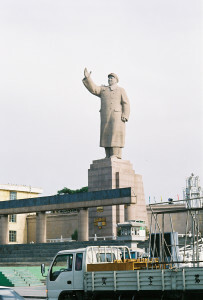 No official commemorations have been held, although some Mao loyalists have staged private events. 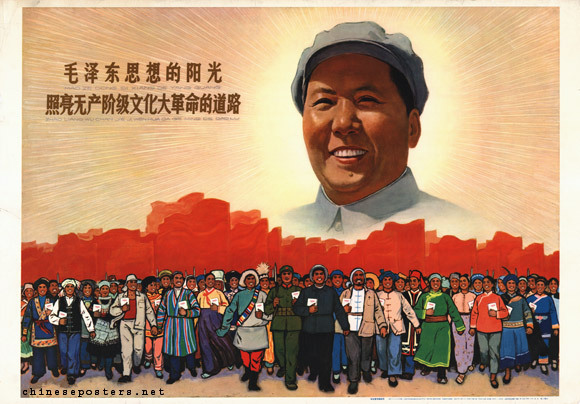 “The sunlight of Mao Zedong Thought illuminates the road of the Great Proletarian Cultural Revolution.” Reproduced by permission of Marien van der Heijden of Chineseposters.net. 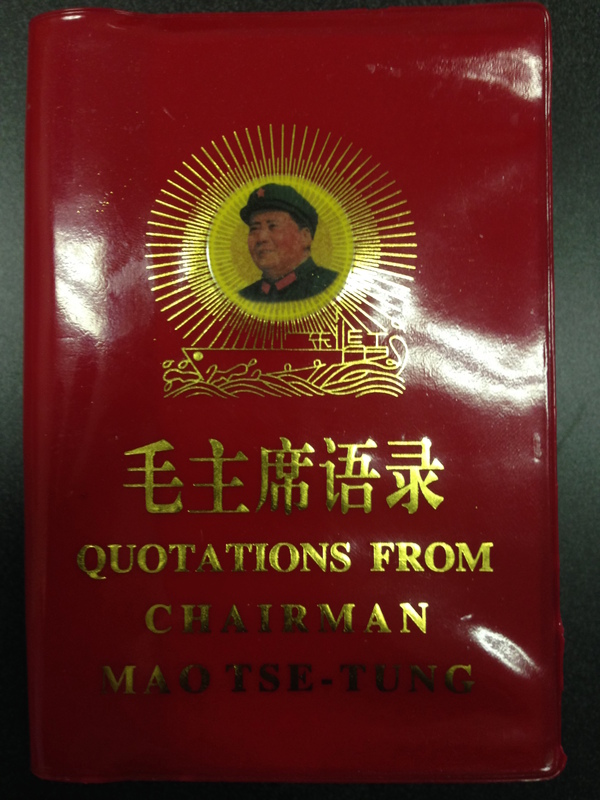 And if you’re going to be buying Mao stuff, how can you not pick up a Little Red Book? 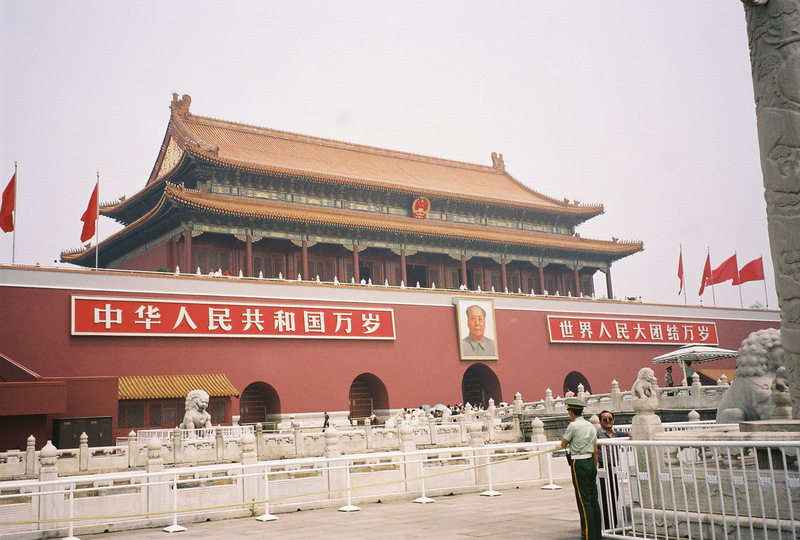 Mao’s portrait on the Tiananmen Gate, where he proclaimed the People’s Republic of China on October 1, 1949. 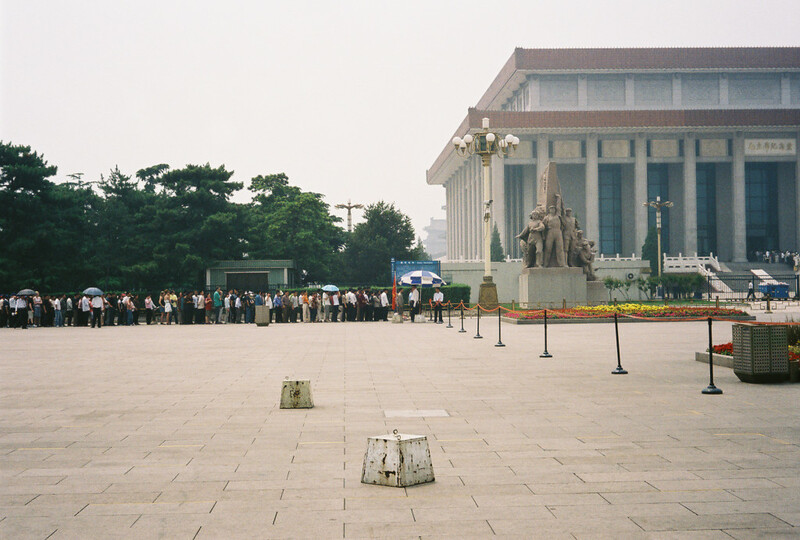 A line of people waiting to be admitted to Mao’s Mausoleum in Tiananmen Square. 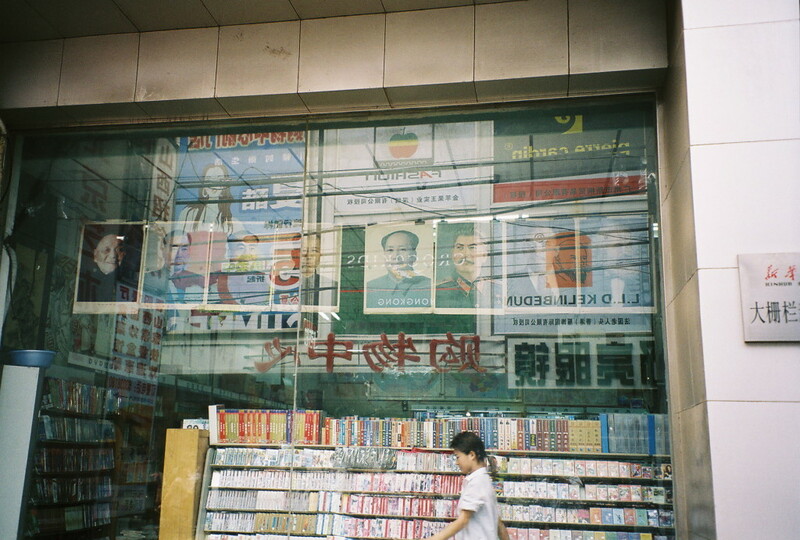 Poster of Mao (accompanied by posters of Stalin, Lenin, and Marx) in a bookstore window, Beijing. Statue of Mao in Kashgar, Xinjaing Province.